I have been carefully trained to look upon garlic powder with great disdain. At the third Ann Arbor Ignite last Thursday, the audience cheered and applauded when the last speaker exhorted us to use fresh garlic instead of dried or powdered (about 41:40 here). And sure, in a recipe like the bolognese he was describing, I’d probably use fresh garlic, too, but that’s hardly a reason to cheer. The crowd’s reaction instead seemed symptomatic of the emblematic status fresh garlic has achieved. Its superiority has become one of the central commandments of the “food revolution,” and no wonder, it hits all the right notes: seems more “natural” and more “authentic,” supposedly better-tasting, and possibly healthier (although, as that site notes, it’s possible to dehydrate garlic without deactivating the enzymes with therapeutic value, which cooking can destroy). It also has the added bonus of a built-in villain in the form of its dehydrated, powdered counterpart, which for many people is associated with the industrial food system, bland mid-century midwestern cooking, and laziness. But aside from being slightly more convenient for busy or novice cooks, garlic powder really works better for numerous applications—it dissolves in dips and gravies, it keeps dry rubs dry, and it can be sprinkled to taste on popcorn or pizza or whisked into the dry ingredients of any bread recipe. Instead of thinking of it as a bad substitute for the fresh stuff, I prefer to think of it as a pedestrian version of the powders made by bleeding-edge chefs like Alinea’s Grant Achatz and WD-50’s Wylie Dufresne. Sure, they often taste different than the non-powdered versions, but they open up a whole array of different uses. Of course, you could make biscuits with a garlic-infused fat or stud the dough with chunks of raw or roasted garlic, but neither of those options is going to give you the same intensity of flavor or evenness of distribution as garlic powder. And these biscuits definitely challenge the notion that powdered garlic can’t be delicious. Most recipes for cheddar–garlic biscuits, even Paula Deen’s, simply suggest adding garlic powder and grated cheddar to a baking mix like Bisquick. That would probably be pretty good too, but I don’t have enough uses for Bisquick to keep it around (especially given that rumors about toxic molds developing in expired pancake and biscuit mixes turn out to be true, if somewhat overblown). So instead, I added garlic powder and grated cheddar to the recipe I use for rich, buttery biscuits. The recipe has a higher proportion of fat : flour than most baking powder biscuit recipes, so it makes biscuits that are rich enough to eat plain (and too rich to make a very good vehicle for gravy or butter). Whatever fat you use, it must be solid so chunks of it will remain in the dough. Those chunks melt during baking to create the flaky layers. Lard or shortening work slightly better than butter or margarine because they don’t contain water. However, butter is delicious, so I used half butter and half lard. If you don’t eat butter or lard, margarine or vegetable oil shortening should work equally well (although if you’re avoiding trans-fats, you should stick to ones composed largely of palm oil or produced by fractionation). 1. Preheat the oven to 500F. Cut the fat into pieces and chill while you prep the remaining ingredients. 2. Whisk together the flour, baking powder, baking soda, salt, sugar, garlic, and herbs if using. 3. Toss the chilled pieces of fat with the flour and and combine them with a pastry cutter, crisscrossing knives, a food processor, or your bare hands—just don’t melt the bits of fat. You want the largest pieces of fat to be about the size of small peas. 4. Mix in the grated cheddar and the buttermilk or milk. Stir just until most of the flour is moistened—you don’t want gluten to form so the goal is to handle the dough as little as possible once you’ve combined the wet and dry ingredients. 5. Dust a table or countertop with flour, dump the dough onto it and press or knead together just enough to form a dough. Flatten the dough to between 1/2” and 1” thick and cut desired shapes—if you don’t have a biscuit cutter, a glass or empty jar will work, or you can just cut the dough into squares or triangles. 6. Place on an baking sheet (ungreased) and brush the tops with buttermilk. Place in preheated oven, and reduce the oven temperature to 450F and bake for 7 minutes. Rotate the baking sheet and bake another 5-7 minutes, or until the biscuits are golden brown. Trans-fats have been in the news sporadically in recent years, thanks largely to the bans passed by the New York City Health Department and the Indiana State Fair. Even consumers who don’t read the news have undoubtedly become familiar with the term because of food manufacturers labeling their products “0 Trans Fats!” (often with a small-print “per serving” which usually means there are trans fats in the product, just less than .5 g per serving) or “Trans-fat free!” whether or not they ever contained trans-fats in the first place. But there still seems to be considerable confusion about what trans-fats are and why they might be bad for your health, which has likely been complicated by the long, stupid demonization of fats qua fats and saturated fats as a supposed cause of high cholesterol and heart disease. 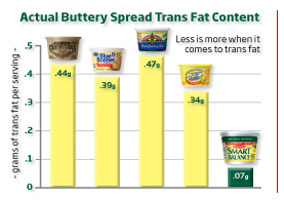 Trans-fats are trans isomers of fatty acids, and although they occur naturally in small amounts in meat and dairy products from ruminants like cows and goats (in the form of vaccenic acid), the primary source of trans-fats in most Americans’ diets is hydrogenated vegetable oils. Most vegetable oils are composed primarily of unsaturated fats, which tend to be liquid at room temperature. In the early 20th Century, when the U.S. started importing soybeans as a source of cheap protein, soybean oil became readily available as a byproduct and was far cheaper than butter or lard. However, liquid and unsaturated fats get rancid much more quickly than solid fats, have a lower smoke point, and were unsuited to many American culinary traditions—biscuits and pastry crusts or all “short breads”* absolutely depend on solid fats to create their flaky texture, as explained in the note at the end. Hydrogenation, a process first developed by French and German chemists around the turn of the century, provided the solution: heating the liquid, unsaturated fats in the presence of hydrogen turned them into solids at room-temperature. Apparently, cottonseed oil was also far cheaper than the beef tallow used in candles, so that one of the first uses of hydrogenated oils. 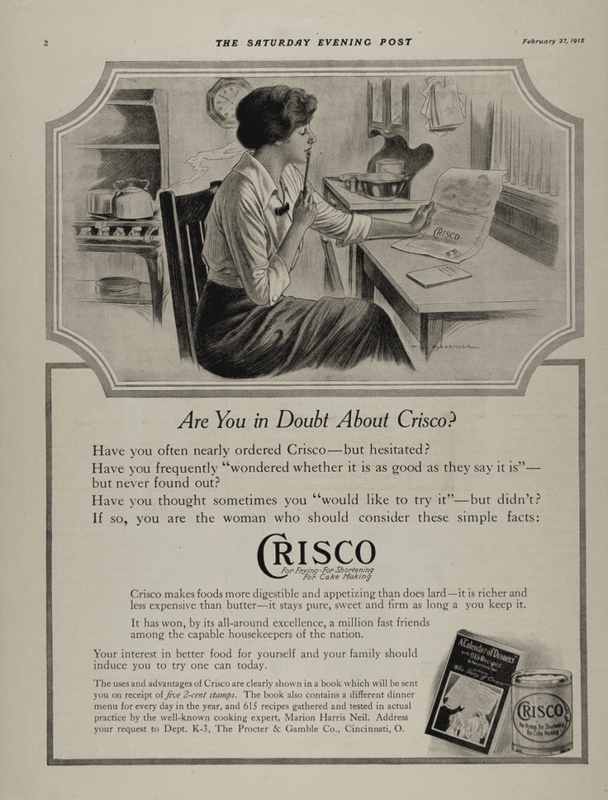 It took a little marketing work to convince people it was also good eating–the major campaign for years was “Use Crisco, it’s digestible!” (okay, actually that probably just reflected the central nutritional concerns of the early 20th C: indigestion and dispepsia, see Hillel Schwartz’s Never Statisfied. According to the classic ‘diet-heart’ hypothesis, high intake of SFAs [saturated fatty acids] and cholesterol and low intake of PUFAs [poly-unsaturated fatty acids] increase serum cholesterol levels and risk of CHD. However, few within-population studies have been able to demonstrate consistent associations with any specific dietary lipids, with the exception of trans fats and n–3 fatty acids. In other words, everything you’ve heard in the last decade about trans fats (bad) and omega-3s (good) actually seems to be supported by the available research, unlike everything you’ve been told for the last five decades about saturated fats. The observational evidence that TFA are independently associated with increased risk of CHD events is convincing, though based on a more limited body of evidence. There is probably no direct relation between total fat intake and risk of CHD. So the persistent recommendation from public health and nutrition authorities to reduce total fat consumption? Not supported by the available evidence. But the reason this isn’t a "things that won’t kill you" entry is because, well, trans-fats might. The short version: lard before margarine or shortening, except when the lard is shelf-stable or the margarine/shortening is produced using fractionation and palm oil. This whole series of entries was inspired by the casual research I was doing to figure out what kind of fat I should use in the Christmas cookies I wanted to send to distant relatives. Before that, I generally used butter when baking, primarily for its flavor but also because of a vague belief I had that butter is more "natural" and thus potentially "healthier" than margarine or shortening—at least partially-inspired by the explosion of negative publicity about trans-fats in the last decade. However, the goal of the Christmas cookies was to replicate recipes used by my grandmother, and those generally call for shortening. "Shortening" can refer to either animal or vegetable-based semi-solid fat, named for the "short breads" or "shortcake" they produce,* but in my family, it’s only ever meant one thing: big blue cans of Crisco, which even with the new formula, still includes trans-fat. If I had been making the cookies for myself, I might have just substituted butter and never bothered to look into it further. But aside from the flavor difference, butter also produces a thinner, crisper, and more delicate cookie because it’s only about 80% fat compared to shortening’s 100% (the other 20% is mostly milk solids and water). That’s fine if you like that sort of thing, but in this case was a problem both for verisimilitude and stability—I need them to get to their destinations at least mostly intact. Lard seemed like the next best choice, being, after all, the other traditional solid fat that hydrogenated vegetable shortening was developed to mimic. But I felt hesitant about that because even though the family members I’m sending them to aren’t vegetarians, lots of people react with horror to the idea of eating lard. I would basically never dare to make something with lard and take it to a potluck lest people ask for the ingredients and then react the way people did when this guy took lard-containing liver pate to a Christmas dinner last year: making horrid faces and saying lard "will kill you." It’s not like they could have expected it to be vegetarian or low-fat—it was liver pate. People are just scared and disgusted by the idea of eating lard. Even I had this lingering sense that lard was supposedly "artery-clogging" or somehow terrible for you, and assumed that was because it was high in saturated fat. As any readers who’ve been swept up in the minor lard revival probably already know, lard is primarily composed of unsaturated fatty acids (56-62% depending on where on the pig it comes from and how it’s processed). So even if the reason you think lard is scary and bad is that you think saturated fat is scary and bad, lard is considerably better than butter (~36% unsaturated and 64% saturated), which people seem generally way less freaked out by. I’m still working through the lard, and deeply impressed by the pie crust and biscuits it produces, but I’m not convinced it’s a good idea to eat it. So ultimately, for the cookies, I decided to use a 50-50 combination of butter and the vegan shortening produced by Spectrum Organics, which is composed primarily of palm oil—naturally a solid at room temperature. I can’t be entirely confident that butter made from corn-fed, antibiotic and hormone-treated cows is necessarily "healthier" than almost entirely non-hydrogenated margarines, like Smart Balance. After a lot of mostly-fruitless efforts to find more information about what trans-fats might actually do to human health, I finally concluded that, as with most issues of diet and health, it’s complicated. Which is to say, there’s not a lot of information out there, likely because it would be extremely difficult and expensive to study with enough control and for a long enough duration to make very good conclusions. But I also can’t find any evidence that butter, even from industrial-agriculture cows, is unhealthy. The cookies tasted buttery, but weren’t too fragile, and apparently got to their destinations mostly intact. Beyond that, I think you might as well choose on the basis of taste and texture preferences or moral considerations (animal welfare, environmental sustainability, labor issues, etc., not that those are any clearer or less complicated). *Short breads are distinguished from yeasted breads by their lack of long gluten strands, which can’t form when the protein in the flour is coated in fat, although that’s not, apparently, the origin of the name, which instead refers to the crumbly, flaky texture. The use of the verb "shorten" to mean "to make something friable or crumbly" was first used in reference to the effect of sand in soil and applied to breads long before the existence and function of gluten was understood. So that seemed like a neat coincidence, at first, but then I realized if it was really just about coating the flour in fat, there’s no reason only solid fats would be referred to a "shortening" because oil could do that just as well, if not better. But you can’t just substitute oil for shortening and still get flaky, crumbly biscuits or pie crust. What actually produces the flaky texture is the combined lack of gluten strands and the chunks of solid fat that melt as the bread bakes, creating thin layers between the layers of flour. So what initially seemed like a really neat faux-etymology turns out to not be as cool after all. Le sigh. This is probably going to be an even harder sell than MSG, but I swear I’m not just trying to be contrary. It’s true that all the major sources of public health and nutrition advice, including the Harvard School of Public Health, Mayo Clinic, CDC, and American Heart Association continue to refer to saturated fats as "bad fats" and suggest that people avoid them as much as possible, limit them to <7-8% of their total caloric intake, and replace them with "good," i.e. unsaturated fats, whenever possible. It’s also true that there are a few studies that suggest that increased saturated fat consumption is correlated (albeit weakly) with cardiovascular disease (CVD). However, many other studies have found no increase in CVD associated with saturated fat consumption. And several recent review articles have concluded that the evidence for a connection between saturated fat consumption and CVD is inconsistent, insufficient or nonexistent. The most confounding phenomenon for the theory that saturated fat consumption causes heart disease (sometimes called the lipid hypothesis or lipid-heart hypothesis or diet-heart hypothesis) is the virtual non-existence of CVD in multiple populations that eat way more saturated fat than most Americans. This has primarily been documented in the Pacific islands where coconuts, which are very high in saturated fat, are a staple food. For example, before the 1970s, the inhabitants of the island Tokelau got an estimated 55% of their calories from saturated fat, but heart disease was virtually unknown (according to Gary Taubes and Stephen Guyenet; notably, since their diet has shifted to include less saturated fat but more sugars and refined carbohydrates, many health indicators have worsened). Many proponents of "natural" foods have already embraced the coconut as a source of "healthy" fat, but the confounding phenomenon isn’t unique to coconut-eaters. The Masai of Kenya and Tanzania and Fulani of Nigeria, whose traditional diet is composed primarily of cow’s milk, meat, and blood and estimated to be 33% saturated fat, also had virtually no incidence of CVD—or didn’t until they started eating refined carbohydrates. Red meat and dairy sources of saturated fat are about as classically "unhealthy" as you can get, and yet don’t necessarily cause heart attacks and death. The differences can’t be attributed, at least entirely, to genetics, and not just because the phenomenon is consistent among so many far-flung populations. The Masai are known to be highly genetically diverse due to conflict/intermarriage, and all of the populations have experienced changes in their health as their diets have changed. Nor are the changes likely due to higher activity levels, cyclical feast and famine, average lifespan, or the absence of other risk factors like cigarette use in these populations. A 1993 study of diet and health in Kitava, the Trobriand Islands, and Papua New Guinea found that Kitavans get an average of 17% of their calories from saturated fat (compared to about 10% for Americans or the <7% recommended by the AHA), tend to be about as active as moderately active Swedes, and have virtually no experience of food scarcity or shortage. Furthermore, 75% of the population smokes. Nonetheless, stroke and heart attack basically don’t exist even among the elderly there, and their fasting insulin levels are significantly lower than Swedes’ in every age group. Another potentially confounding fact that some low-carb proponents point to is the alleged decline in the average American’s consumption of saturated fat. It’s true that the consumption of some primary sources of saturated fat like butter and lard declined for most of the 20th Century; however, per capita red meat consumption grew until the 1970s, and according to the USDA, the proportion of saturated fat in the U.S. food supply has remained pretty steady for the last century. What is clear, at least, is that increasing rates of cardiovascular disease were not caused by increasing per capita consumption of saturated fats. So why the hell have the institutions we trust to tell us how our diets affect our health spent the last half-century trying to convince us that saturated fat clogs your arteries, causes heart attacks, and might kill you? I know, I sound like a climate change skeptic, but this is way more blatant than some sketchy e-mails. The research that first convinced many Americans and public health institutions like the AHA that saturated fats cause heart disease was the Seven Countries Study led by Ancel Keys. Keys and his colleagues carried out surveys of men (only men because the rate of CVD in women was considered too low to merit attention) in eighteen rural regions in Italy, the Greek Islands, Yugoslavia, the Netherlands, Finland, Japan, and the U.S. The regions were supposedly chosen because they were areas with stable and widely-contrasting diets. The researchers asked the men about their eating habits, performed chemical analysis on meals prepared by randomly-selected families, and compared their findings to the rate of disease and death in the different populations, with special attention given to CVD and "risk factors" like serum cholesterol levels. They concluded that higher levels of dietary saturated fat cause elevated serum cholesterol and heart disease. The especially low rates of CVD in Crete, despite relatively high proportions of dietary fat, were a large part of the impetus behind the "Mediterranean Diet" and the idea that olive oil is nutritionally sacrosanct. However, as many people later pointed out, it seems more than coincidental that Keys only included regions where both saturated fat consumption and heart disease were high or where they were both low. Apparently, data was available for a number of other countries (anywhere between 15 and 27, according to various critics), perhaps most notably France, which would have been just as easy to study as Finland and Japan. Keys seemingly ignored, or systematically excluded, all confounding data from his analysis. The dietary assessment methodology was highly inconsistent across cohorts and thoroughly suspect. In addition, careful examination of the death rates and associations between diet and death rates reveal a massive set of inconsistencies and contradictions…. It is almost inconceivable that the Seven Countries study was performed with such scientific abandon. It is also dumbfounding how the NHLBI/AHA alliance ignored such sloppiness in their many "rave reviews" of the study…. In summary, the diet-CHD relationship reported for the Seven Countries study cannot be taken seriously by the objective and critical scientist. The problem seems to be that Keys had already decided that saturated fat was the problem. According to the Time magazine cover article (click the picture to read it), Keys had treated a heart disease patient with large knobs of what turned out to be cholesterol under his skin and very high serum cholesterol. When he put that patient on a low-fat diet, his cholesterol went down. Since cholesterol is what clogs arteries and causes heart attacks, and foods high in saturated fat are often also high in cholesterol, Keys concluded that the high rates of heart disease in American men were caused by the saturated fat and cholesterol content of their diets. In the Seven Countries study, he set out to prove that theory (as opposed to testing it). Fifty years of subsequent research have not found a consistent or reliable correlation between saturated fat consumption and heart disease or death. This entry got a little out of hand, so I split it into a couple of parts. More coming soon on dietary cholesterol and the dreaded LARD, neither of which, it turns out, are likely to kill you or even probably hurt you a little bit. Also, an epilogue of sorts on trans-fats, which might actually kill you.